Smart snacking is important when trying to lose weight. One of the tricks to eat clean is to not let yourself get too hungry in between meals. It is also wise to bring your own food with you whenever possible. I bring my own snacks on airplanes, all day outings, when I run errands, to work. I could go on, but I will spare you. Now that you are committed to eating clean, you need a list of high protein, healthy go-to snacks to carry with you. If you do not have a cooler, get one today. We carry the perfect size coolers Mo-Mentum Fitness or you can also find coolers on Amazon and in most Targets etc. Preheat oven to 425 F. In a large bowl, combine the olive oil and salt, whisk, then add the cauliflower pieces and toss thoroughly. 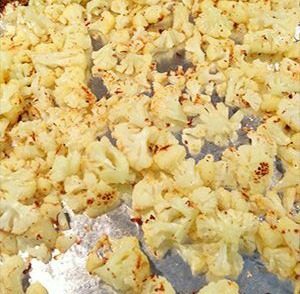 Line a baking sheet with aluminum foil for easy cleanup, then spread the cauliflower pieces on the sheet and roast for 1 hour, turning 3 or 4 times, until most of each piece has turned golden brown. Serve immediately for optimum flavor. Preheat oven to 250 degrees. 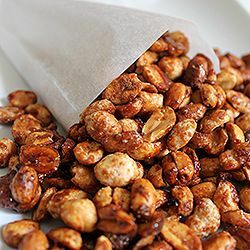 Combine nuts and spices together in a bowl. Transfer to a foil lined pan and bake for 25-30 minutes. 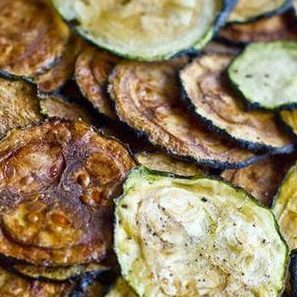 Mix the zucchini coins in a bowl and coat with olive oil and garlic powder. Spread out on a foil lined cooking sheet and bake for 45 minutes. Let stand for 45 minutes before serving.